Thousands walked the National Mall and stood in the shadow of the Lincoln Memorial in a pair of events on Aug. 24 and Aug. 28 to commemorate the 50th anniversary of the March on Washington for Jobs and Freedom. In 1963, those at the March on Washington were galvanized by the words of the Rev. Martin Luther King Jr., whose “I Have a Dream” speech electrified a nation and pushed it, sometimes against its will, to guarantee civil rights to all Americans. The presence of Catholic priests and religious was unmistakable at the first March on Washington in 1963; their clerical collars and full religious habits stood out even among the black-and-white photographs of the day. To mark this anniversary, the current archbishop of Washington, Cardinal Donald W. Wuerl, participated in an interfaith prayer service on Aug. 28 at Washington’s Shiloh Baptist Church. Recalling the words of Dr. King, Cardinal Wuerl told those gathered, “We have been invited to form one great human family that walks hand in hand.” Noting that schools in the Archdiocese of Washington were integrated “before the Supreme Court got around to it,” Cardinal Wuerl said that an academically excellent and morally based education will help future generations realize Dr. King’s dream. Many African-American Catholics attended the commemorative marches, just as they were present a half-century earlier. “I never thought about not being here,” declared Donna Pasteur, a member of St. Augustine Parish in Washington, at the march on Aug. 24. The issues that brought about the first march, in her view, stubbornly remain today. “I see the inequality in jobs and justice,” Pasteur said.“We just have too many people out of work. We don’t have that many good jobs.” Even so, the situation is improving compared to two generations ago, she said. “You pray in different ways. You pray with your own presence, too, for jobs and justice,” repeating the theme of the march in 1963. There was a “Catholic conversation” on the church, race and the march on Aug. 25 at the historically African-American Holy Redeemer Catholic Church in Washington. Patricia Chappell, S.N.D.deN., executive director of Pax Christi USA, said at the event that Catholics must stop being complacent about militarism, racism and poverty. This drew applause and cries of support from the audience of nearly 200 people. Sister Patricia called for the church to “go back to Catholic social teaching” because it clearly lays out responsibility to speak up in support of education, housing and job programs that would help the poor. Sister Patricia said the institutional church has done too little recently to speak up about the systems that allow racism to continue to exist. “We need to make a connection between militarism, racism and poverty,” she said. 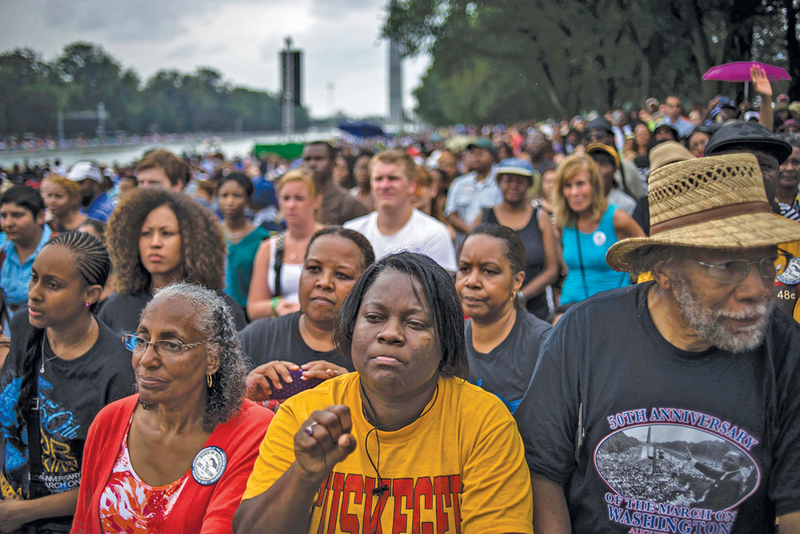 This article also appeared in print, under the headline "Remembering the March on Washington and M.L.K.’s ‘Dream’," in the September 23, 2013 issue.